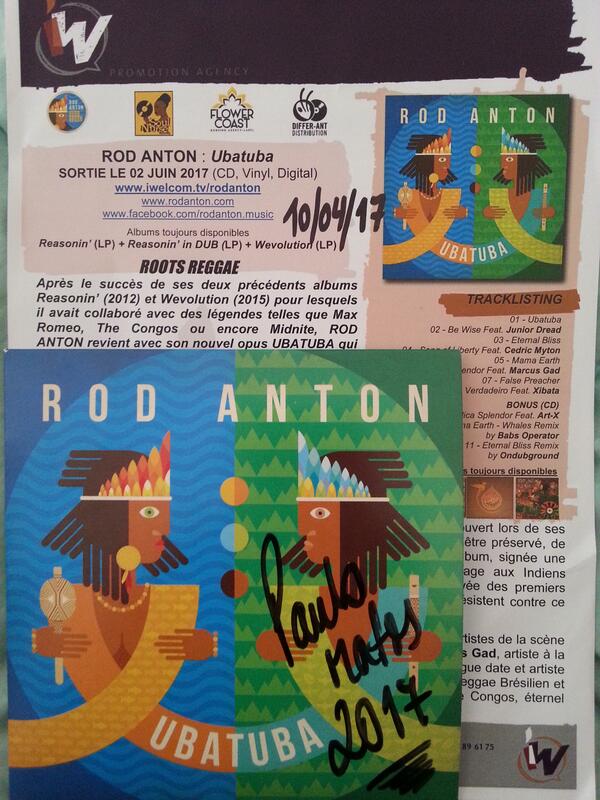 After the success of his two previous albums Reasonin '(2012) and Wevolution (2015), for which he collaborated with legends such as Max Romeo, The Congos and Midnite, ROD ANTON returns with his new opus UBATUBA which will be available in digital , CD and for the first time vinyl. A modern 80s-style Reggae music composed entirely by Gabriel Bouillon, talented alchemist of the label SoulNurse Records and texts in English and Portuguese, Rod's mother tongue, always borrowed from love, travel, call to unity And cries of revolt against the corrupt of this world. The title of the album is the name of a city on the south-east coast of Brazil, located between land and sea, a town with turquoise waters and sublime beaches, lush nature with its thousand waterfalls ... place Rod Discovered during his travels and of which he fell in love, the perfect example of what must be preserved, of that beauty which we must bequeath to our children. The cover of the album, signed again by Christophe Deleau (www.snzd.com), is a tribute to the Tupinamba Indians who inhabited this region before being exterminated at the arrival of the first settlers, a tribute to all Oppressed indigenous peoples who resist this system that attempts to devour them. To accompany him in this new odyssey, Rod has appealed to artists from the international Reggae scene. Marcus Gad, an artist with a golden voice who comes from New Caledonia, Xibata, a friend of Rod of long standing and recognized artist of the Portuguese Reggae scene, Junior Dread, young hopeful of the Reggae Brazilian and again Cedric Myton, singer of the legendary group Jamaican The Congos, eternal comparator and teacher of Rod, present on all his albums. "UBATUBA" is a new ode to love: love of oneself, love of others, love of nature around us, a universal love advocated on a sharp Roots Reggae! Rod Anton definitely poses as one of the actors not to be missed on the international roots scene. The album will be available on CD / Digital / LP. Massive combination in Portuguese with Xibata ! One of the best releases of the year !